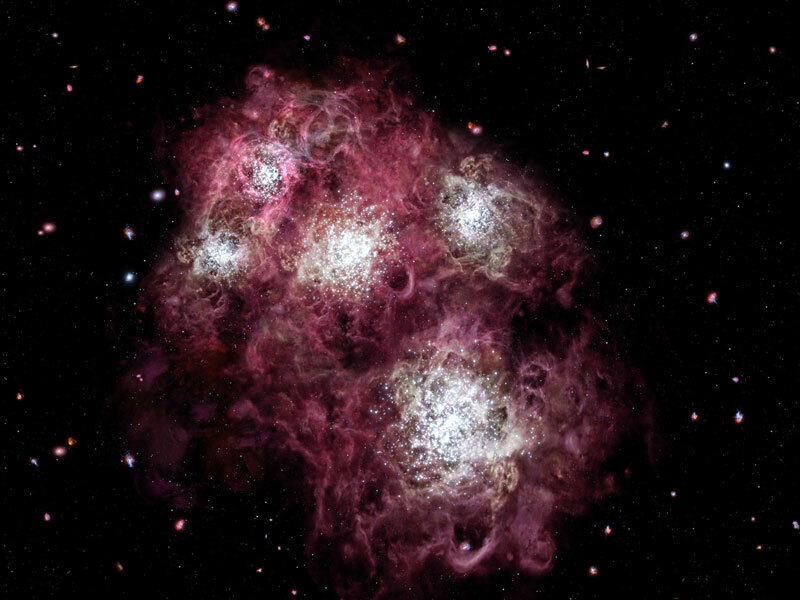 Images of claimed galaxy. The galaxy is within the square on the main image. In visible light (top right) it does not show, but in the infrared Spitzer (bottom right) it appears as a white blob. It certainly sounds like they have made some astounding astronomical observations, considering the grand scale of the events they describe. But have they really? We need to look more carefully at the detail. Their announcement is basically a vivid retelling of the standard big bang story of the origin and evolution of the universe. They have only added a tiny bit of extra data. The ‘fact’ of the big bang as the true origin of the universe is assumed without question. It is like saying “It must have happened this way because we can see these galaxies today”. Isn’t that just a statement of belief? Yes! First they accept by faith that the big bang happened, that ‘nothing exploded’ and filled the universe with mostly hydrogen. Then they accept the cosmological ‘dark ages’ took over until at some point the neutral hydrogen coalesced to form stars and galaxies. Then, they imagine that as the nuclear reactions within the stars turned on, the galaxies heated up and re-ionized the intergalactic medium, which became transparent, and we see these ‘early’ galaxies. Artists impression of the galaxy is much more convincing than the Spitzer image above. In other words, their entire report is wrapped up in their belief about what happened in a galaxy far, far way (billions of light-years in fact), and in the far, far distant past. But when you look at what they actually measured, you find it is very meager indeed. And even those results seem to bordering on the speculative. First they quote a redshift for the galaxy of 7.6. This would be quite an achievement because the noise associated with such a measurement would be significant—possibly of the same order of magnitude as the signal they are trying to detect. Clearly they are pushing the limits of what the Hubble Space Telescope can see. Something of the incredible amount of subjective interpretation can be seen when you examine the figures published with the journal (figure).2 The evidence as seen in the infrared part of the spectrum appears on the right as a blur, and this blur is interpreted as the infant galaxy. 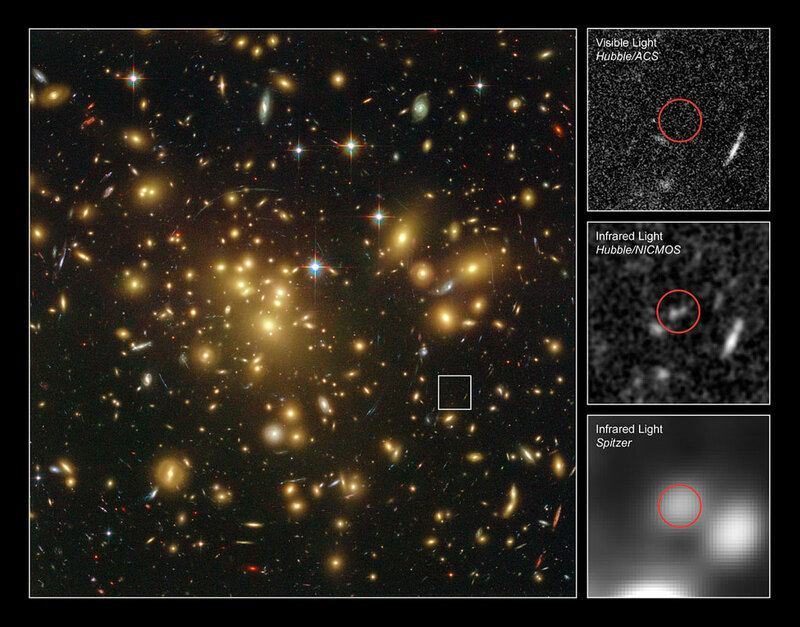 Because of limitations of making direct observations at this distance, they are assuming that a phenomenon called gravitational lensing has occurred in this case. That is a genuine possibility under general relativity, but it is fraught with uncertainty because the galaxy may not be lensed at all. Only from the measured redshift of 7.6 and the assumption of the Hubble law being a valid distance indicator for this object does it follow that it is gravitationally lensed. From the information on the images it is difficult to be sure of exactly what you are viewing through the so-called natural lens, i.e. that all other possibilities have been accounted for. One possibility is that the object is a quasar. These stellar objects have an unusually high redshift structure that seems to be related to some discrete or quantized phenomenon. Even though the report said that they don’t think quasars provide enough energy in the ‘dark ages’ of the universe, it is not certain that the quasar possibility has been eliminated. If a quasar was the source and its redshift was not primarily cosmological in origin but intrinsic the source would not be as distant as the Hubble law suggests. Surely more data is needed and more similar such objects with comparable redshifts should be examined. Strangely enough the report says the measurements are ‘highly reliable’, which could make you wonder whether they are trying to strengthen their case for this galaxy being the strongest candidate so far for the most distant galaxy. It’s interesting that they use the term ‘candidate’. It’s also interesting that the illustration with the article is an artist’s impression of an embryonic galaxy. The published figure of the gravitationally lensed image is nowhere near as convincing due to its low surface brightness and pixel-small size, being at the limit of image resolution. With a redshift of 7.6, the report says they are looking back to just 700 Ma after the big bang. This is a little surprising in itself because the numbers quoted for the ‘dark ages’ period are usually between a redshift of 10 and 20. This would put a galaxy with a redshift of 7.6 (within their thinking) as about only billion years old, hence the cited 700 Ma. 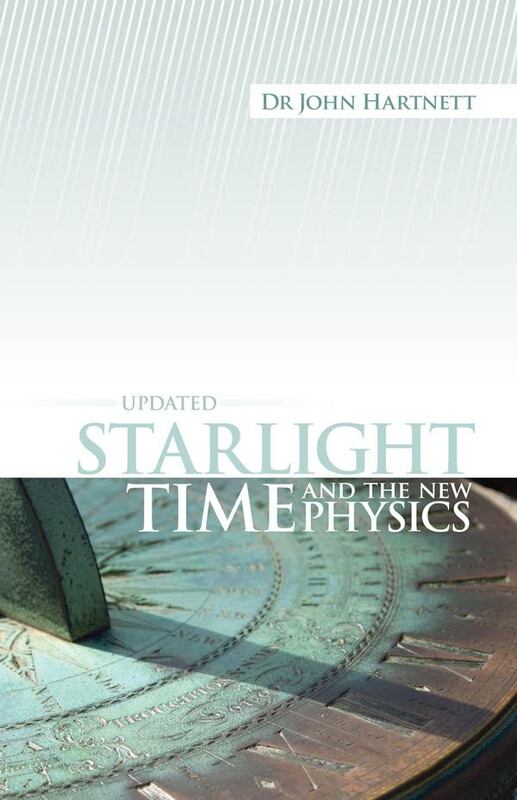 The exact timing depends on the parameters of the particular cosmological model they use, which involves the amount of dark matter and dark energy assumed. It’s an impressive press release, but it is very early days. Clearly it very difficult to get good data on objects at such high redshifts (assuming it is very distant). Details of the ‘galaxy’ and its exact redshift still have to be confirmed by more soundly based observations—using deeper scans of the region of space. That is what needs to be done and is hoped can be done with the future James Webb Space Telescope and the ALMA large radiotelescope array that can ‘see’ into the infrared. So is this another case of ‘I wouldn’t have seen it unless I had believed it?’ We’ll have to wait and see. 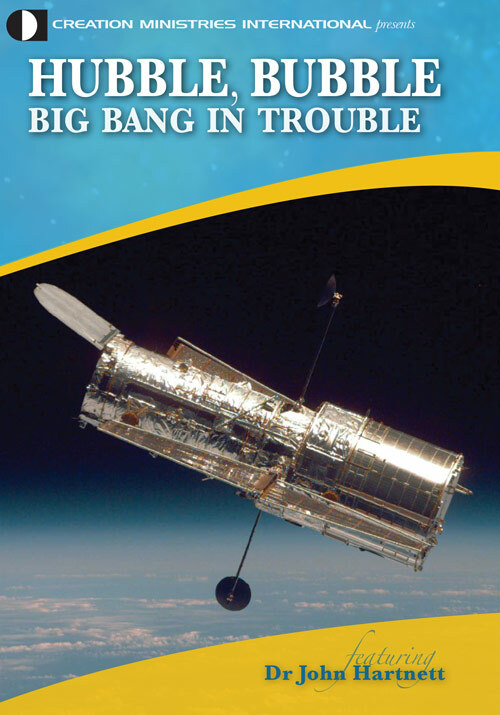 NASA/ESA Hubble Space Telescope, heic0805: Hubble finds strong contender for galaxy distance record, ScienceDaily, 12 Feb 2008, Hubble Finds Strong Contender For Galaxy Distance Record, ScienceDaily, 13 Feb 2008. Return to text. heic0805a.jpg accessed 14/02/08. Return to text. Science News, ESO’s Very Large Telescope smashes the record of the farthest known galaxy, ScienceDaily, 2 March 2004, accessed 14/02/2008. Return to text. Hartnett, J.G., Cosmological interpretation may be wrong for record redshift galaxy! Journal of Creation 18(3):14–16, 2004; Hartnett, J.G., Record redshift galaxy is probably spurious, Journal of Creation 19(1):60, 2005. Return to text.